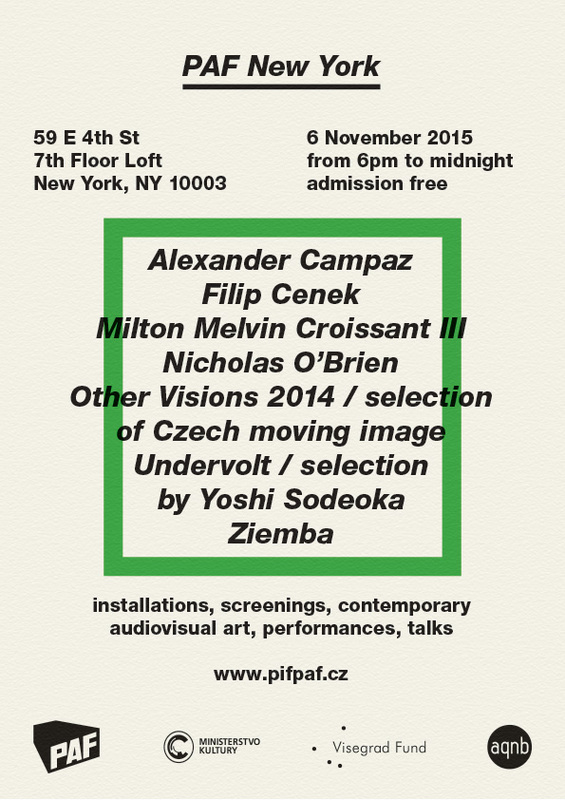 POSTED BY: crazymerry | Sat Oct 31st, 2015 6:17 p.m.
One day festival of contemporary art organized by PAF in New York City will take place Friday November 6th, 2015 at 59 E 4th St, 7th floor loft. Installations, screenings, talks, contemporary audiovisual art, performances and concert. Taking place within the Fourth Arts Block, one of only three official art districts in the City, the PAF festival will feature projects by a variety of contemporary artists based in Czech Republic and New York. The key element for the selection of artists is the focus towards the phenomenon of film animation and experiments with the art of the moving image. The mixture of international artists gives similarities, singularities and sur-realities, and is welded together by the unique spirit of the wide conception of animation phenomena in the context of cinematography, media studies, visual arts and music, that is omnipresent in all events organized by PAF since 2008. Curated & organized by PAF Olomouc with special thanks to Alexander Campaz.